Whether watching it for the first time or the fiftieth, it’s hard not to be awed by the sheer power and economy of the storytelling in The Incredibles. Four years before the launch of the MCU, Brad Bird’s 2004 film is a master class in meshing “serious” themes like the importance of family and the dark side of hero worship with all things super. Think of the criticisms often leveled at superhero films today. Villain problem? Syndrome (voiced by Jason Lee) is a diabolical nemesis with a master plan both sensible and deadly (especially to heroes). (And his origin story is both unique and at least initially easy to empathize with.) Failure to give female heroes their due? 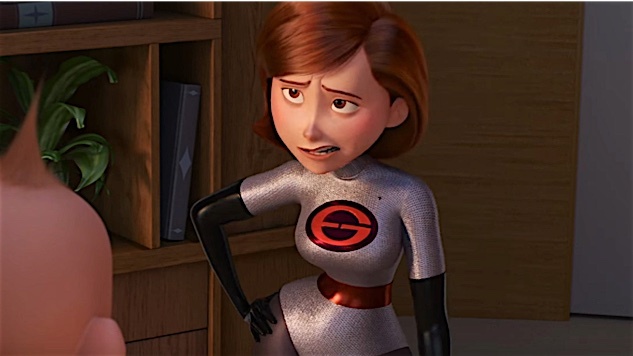 Elastigirl (Holly Hunter) is portrayed as the equal to Mr. Incredible (Craig T. Nelson) right off the bat, and her infiltration into Syndrome’s lair later in the film is as impressive as any fight scene in Wonder Woman. Lacking heart? The family dynamics woven throughout the film—sibling, spousal, parental—are touching and, often, hilarious. By comparison, the long-awaited The Incredibles 2 is inescapably messier throughout. The villain and scheme are not quite as compelling, and the choreography of character and location—another hallmark of the first film—is a perceptible degree sloppier. Nonetheless, it feels great to be back. The Incredibles 2 starts right where the first film ended, with the costumed Family Parr reacting to the arrival of the Underminer (John Ratzenberger). Their scuffle with the villain gains the attention of Winston Deavor (Bob Odenkirk)—or more precisely, allows Deavor and his sister, Evelyn (Catherine Keener), to gain the attention of the Parrs. The siblings want to bring supers back into the light, using Winston’s salesmanship and Evelyn’s tech to sway public opinion back to the pro-super side. To do so, they want to enlist Elastigirl as the tip of the spear in their charm offensive, leaving Mr. Incredible on the sidelines for now. (She tends to fight crime in a manner that results in less property damage than her husband, after all.) This sets up a second act that’s firmly by the numbers in terms of story development—watch the husband try to succeed as a stay-at-home dad!—yet no less enjoyable. Bob’s attempts to handle teen romance, Jack-Jack’s manifestation of powers and, horror or horrors, “new” math will strike a chord with any mom or dad who has ever felt overwhelmed by the simple, devastating challenges of parenthood. (The family interactions, one strength among many with the first film, remain a delight in the sequel.) Meanwhile, we get to watch Elastigirl in action, as she encounters, foils and matches wits with the film’s mysterious villain, Screenslaver. As in the first film, watching Helen Parr do the hero thing is also quite the delight—she’s resourceful, tough and, above all, a professional. Watching Elastigirl operate almost makes one feel sorry for the criminals. Delving more into the plot would do the film a disservice—suffice to say both villainous and family challenges are faced, and it takes a village, Frozone (Samuel L. Jackson) and Edna Mode (Bird) to emerge victorious. Whether you enjoy The Incredibles 2 as much as the original will likely depend on your opinion of the latter, but regardless, you’ll be happy both exist. And in today’s sequel-saturated environment, that is practically a superheroic achievement in itself. Michael Burgin is the Movies Editor for Paste. He’s the reason The Incredibles is ranked where it is on our 100 Best Superhero Movies of All Time list.